The ambulance match, RAW Women’s Title match, and Universal Title match are highlighted. Very good match. This was very hard-hitting. It felt kind of like a grudge match that had been going on longer than it has. The match was fought mostly clean too, so there wasn’t really much in the way of shenanigans. Because of that, the finish felt very satisfying. I can’t imagine this is the end of the feud though. I’m looking forward to their next match. Charly Caruso welcomes the Hardy Boyz. Matt Hardy tells a story about watching 30 minutes of superhero cartoons with his kids, and tonight he and Jeff will fight some real life supervillains. Jeff talks about the history the Hardys have made, and tonight they will make history again. Clips of the partnership and the breakup of Enzo Amore and Big Cass. Enzo Amore heads to the ring. He talks about his and Cass’s main roster debut in Dallas. That was about love, but tonight is war. He quotes “That’s Life” by Frank Sinatra to describe Cass’s betrayal. This was kind of a beating. It wasn’t totally unexpected, but it was pretty much completely one-sided. I thought Enzo might get a little more offense than he did. Cass just took his time and had no trouble at all. I think it works for the story though. I don’t think the match could have ended any other way. Great match! Cesaro and Sheamus took and early lead with a very strong start. They stayed in the lead, but as expected the Hardy Boyz slowly started to creep back into the match. The match was good throughout the first two-thirds, but it picked up quite a lot in the last ten minutes. The final segment of the match was fantastic. It was a little chaotic, but it needed to be because of how close it became near the end. People were running everywhere, Matt Hardy got busted open pretty bad, and there was some great misdirection and timing. The commentators were calling this a classic, and this is one of those times where I think they might not be overselling it too much. Xavier Woods watches and plays in the Rocket League championships. A promo for John Cena vs Rusev in a flag match at Battleground. Very good match. The end was frustrating, but it fits with the characters and the story. It also sets things up for a rematch which is a good thing. I think this was Alexa’s best match since moving to RAW, and maybe her best match as a champ on either show. This was highly competitive and both women took and gave some very tough looking shots. I’d like to see this feud continue for a long good long while. Frustrated, Sasha Banks chases Alexa Bliss up the ramp. She attacks Bliss, and the two make their way to the announce table. Alexa looks like she’s going to put Sasha through the table, but Sasha knocks her off to the floor below the stage. Sasha then dives all the way to the floor, hitting Alexa with a rough looking double knee strike. Sasha stands tall as Alexa struggles to leave the stage area. Earlier tonight, Akira Tozawa was upset over his loss. He tells Titus O’Neil that he wants a rematch with Neville. O’Neil says he’ll work on it, but he’s obviously frustrated. Good match. This was full of all sorts of pro wrestling shenanigans, but I think that was expected. I kind of expected Ambrose to have a better answer for the Miz-tourage since he knew they’d be there, but he just tried to fight them all. It didn’t work out so well. But it was pretty fun to watch. This is another one where a rematch seems inevitable considering the finish, but I’d kind of like to see The Miz finagle his way out of facing Ambrose again. At least for now. Clips from the Strowman/Reigns feud leading up to the ambulance match. A good match. It was two big guys beating on each other, but I think it was paced pretty well. One issue I had was Strowman practically no-selling Reigns’ attack on his surgically repaired elbow. The commentators made a big deal about it, but Strowman barely did anything to indicate that he was in pain and he still was able to carry Reigns and throw him around with the same arm with no problem. The finish was okay. It made sense and put over Reigns’ comeback in the match and the danger Strowman felt he was in. For that I think it was very well done. After the match, Roman Reigns attacks Strowman and throws him into the ambulance. Reigns gets behind the wheel and drives the ambulance to the back of the arena. He backs the ambulance at full speed into one of the trailers, crushing the back of the ambulance. Reigns gets out and staggers away as Kurt Angle walks up. Angle and Jamie Noble try to get Strowman out of the ambulance, but the doors are stuck. Nobody paid attention to the match. Most of it was overshadowed by a split screen of the match and a shot of the backstage area where everyone was trying to get into the ambulance. The finish of the match wasn’t even shown. It was odd that they even did this. I understand it was meant as a way to show that they were scrambling to buy time and continue the show, but it was a transparent attempt and felt kind of forced. Why not just stay with the action in the back like they usually do with this sort of thing? But hey, Slater and Hawkins made it on PPV. So, cool. The fire department arrives and pries open the ambulance doors. Strowman is pulled from the vehicle. Bloodied, he gets up and staggers away. Angle doesn’t quite seem sure what to make of what he’s seen. This was an exciting match, but like most Lesnar matches it was short. Joe attacked Lesnar from behind before the match started and put him through one of the announce tables at ringside. Joe kept the pressure on when the match finally started, constantly going for the Coquina Clutch. Lesnar was able to get some German suplexes in a few times, but the match was almost completely dominated by Joe. I wish the match had gone on a little longer and that Joe had pushed a little harder at the end, but I still enjoyed the match. It set up Joe as a very strong competitor and a legitimate top guy on RAW. This was a very good show. I enjoyed everything, even the stuff I wasn’t as excited about like the IC Title match and the ambulance match. This was probably the best WWE PPV overall in quite a while. I think it had to be really good because of the silly name. 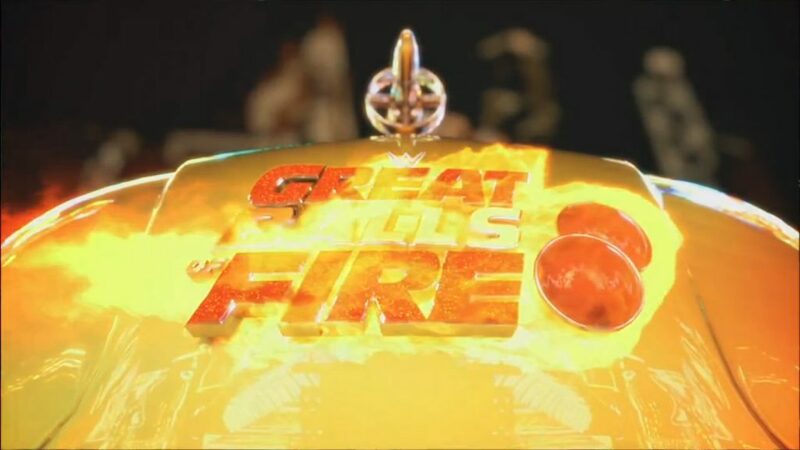 But that means we’ll probably get another Great Balls of Fire next year. If it’s this good, I won’t mind so much. I don’t suppose I really expected Joe to take Lesnar’s title on his first defense, but I was really pulling for him. The way the match ended up is probably good for everyone in the long term. It helps boost the Universal Title’s prestige to have such a viciously hard fought match between two extremely dangerous guys. It also elevated and/or cemented Joe’s status as a top guy in the eyes of everyone who is paying attention. And it showed that Lesnar is dangerous yet vulnerable. He’s not unbeatable, but it’s going to take an awful lot to take him down. As a side note, I thought it was funny when Michael Cole said Brock Lesnar is a “fighting champ” during this match considering he hasn’t defended the title since winning it at Wrestlemania more than three months ago. There were quite a few good matches, but I think my favorite overall and the one I’ll go back to watch the most is probably the tag title match.